7 Ways to Help You Multitask and Still Get the Jobs Done! Have you ever wondered how your boss seems to work on a million projects at the same time yet somehow still manage to be on top of everything? Well, be assured that this situation isn’t exclusive to your boss and that everyone goes through this phase; having so many tasks to do in so little time. Managing multiple projects at the same time can certainly be exhausting. You can easily start slacking here and there because you can’t keep up and you do not have enough time. I know this because I’ve been there myself and so have most professionals across the world. However, I assure you that being able to manage different projects at the same time and doing it successfully doesn’t require super powers. You only need a plan and a a few tips. Here are 7 tips from Bayt.com that will help you become a master in multitasking. Don’t ever solely rely on your memory for recalling all the projects and tasks you need to work on; that almost never works! Make a list of the projects you’re working on and what tasks that needs to be done in each project. In this list, make sure to specify the time needed and the deadline for each project. Start checking things off as you complete them so you can stay in control of your schedule. Lists will keep you organized and will work as a reminder of the tasks you still need to do. Lists are perhaps the easiest and most important productivity booster! When you’re allocating time for each of the tasks on your to-do list, make your most generous guess, then multiply it by 1.2. This way you’ll have an additional 20% of the allocated time as a cushion in case you missed the deadline. Having extra time can also be used to review the details of your project and making sure that everything is accurate. Not only do you need to specify the duration you need to complete a certain project, you also need to designate a date and time to start working on it. If you do not dedicate a specific time block for each project you will easily fall behind and lose your organization. For the most demanding tasks, choose a time when you have the most energy and can perform the best. For tasks that require much focus, chose a time during which you can turn off your mobile, log-out from the instant messenger, and be fully concentrated for a few hours. You can try to convince yourself all you want that you can handle more than that; but believe me, it won’t be a good idea. Time constraints put stress on your creative capacity and you will begin to resent the work. Tasks that are thought-intensive or highly creative need more time and energy. It is best to plan one big task and two small tasks per day. Do not accept additional assignments before at the very least saying “let me check my to do list and get back to you.” This will buy you the time to verify if you are able to manage additional work. If you can handle more; then add it to your list. If not, then you need to be honest, say no, and explain that you do not have enough time for a new project. Remember that it is not impressive to take on additional responsibilities and fail to deliver them. Leave gaps between your scheduled tasks. Go for a walk or have a friendly chat with someone in the office for a few minutes. 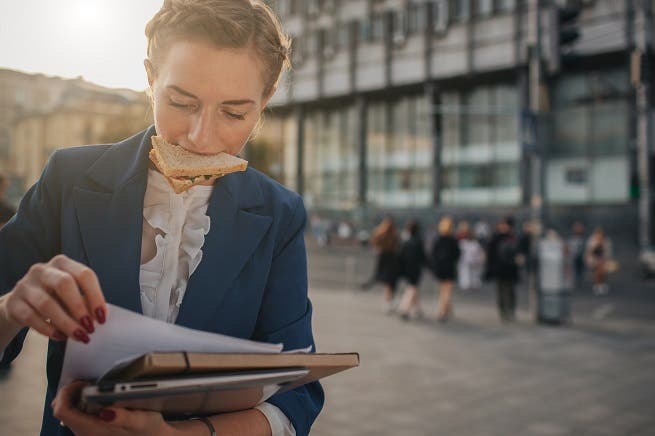 Short breaks will take your mind off work for a little while and when you get back to your desk you’ll be re-energized and ready to work on the next task with more focus. You can’t afford squandering away your time when you have many time-sensitive projects to complete. Do not keep postponing your work, because when deadlines are looming you’ll start panicking. Make sure you avoid procrastination at all costs.